Most researchers agree that the contemporary glacia-tion in the mountains of Central Asia and Kazakhstan is inherited from the preceding stage (Serebryanny, 1984). However, the contemporary orography of the mountains (height and the transverse orientation of many ridges) provides conditions for the accumulation of permanent snow and glaciers. The position of the snow line is high in comparison with the other mounatinous regions of the FSU because of the aridity of climate, high levels of insolation, and supply of heat from the plains in summer. The altitude of the snow line generally increases from the north-east and the north-west towards the arid inner regions of the Pamir. The lowest position occurs on the northern slope of the Dzhungarsky Alatau (3000 m) and northern Tien-Shan (3600 m), increasing to 4200 m in the central Tien-Shan and 5200 m in central and eastern Pamir. Aspects strongly influence the position of the snow line. For example, in the Terskey-Alatau the difference between the southern and the northern slopes reaches 600 m.
The mountains of Central Asia and Kazakhstan are the largest centre of alpine glaciation in the FSU. The combined area of glaciers is approximately 16 000 km2, which accounts for 70 per cent of the total area occupied by alpine glaciers in the FSU. Glaciation has a sporadic pattern characterized by a few regions of glacier concentration such as the Khan-Tengri massif in the central Tien-Shan, the Matchinsky massif where the Zeravshansky, Alaysky, and Turkestan Ridges converge in north-western Pamir, the Zaalaysky Ridge, and the junction of the Peter the First, Academy of Sciences, and Darvaz Ridges in Badakhshan (Figure 16.7). The Fedchenko glacier (907 km2), the largest in the FSU, is located in the latter centre whose tremendous extent is due to the interception of moisture carried by the westerly flow by the transverse Academy of Sciences Ridge. In total, the Pamir-Alay and Pamir accommodate about 9800 glaciers whose combined area reaches 10 000 km2, accounting for more than 10 per cent of the total area. Glaciers of the Pamir and Pamir-Alay are the single most important source of water for the plains of Central Asia. Accumulated in the glaciers are 600 km1 of fresh water and about 13 km3 are delivered annually to the plains. Not only do glaciers occupy a vast area in the mountains of Central Asia and Kazakhstan, but also a variety of glacier types occur and they have especially large dimensions (Table 16.5). Depending on the environmental conditions cirque, hanging, valley, and plateau glaciers develop. The vast and flat plateau glaciers, which do not occur anywhere else in the FSU, develop on the highly elevated denuded surfaces and are particularly common in central Tien-Shan. Because the plateau glaciers occupy watersheds, they receive little derrital material and their moraines are poorly developed. The large branching valley glaciers occur throughout the region. For example, the Fedchenko glacier receives thirty seven tributaries, six of which are more than 10 km long, and the Inylchek glacier in the massif Khan-Tengri receives thirty tributaries, some of which exceed 15 km in length. Typical of the region are glaciers of a specific, so-called Turkestan, type which may be considered as valley glaciers in the stage of decay. The firn area of such glaciers is disproportion-ally small in comparison with the glacial tongue, their nourishment is accomplished mainly by avalanches and they are covered by thick moraine (Fedorovich et al., 1975). The abundance of rock material on the valley glaciers, of both the ordinary alpine and Turkestan types, is due to the intense weathering controlled by strong temperature fluctuations which can be as high as 90°C. The extent of glaciers and their depth vary greatly. The largest glaciers are over 100 km long and their depth may exceed 500 m (e.g., the Fedchenko, Inylchek, Oktyabrsky). In general, large glaciers move at a rate of about 80-100 cm day-1. However, the rate of movement depends on many environmental factors and while the Inylchek moves at about 1200 m a-1, the Fedchenko glacier is less dynamic and moves only 200-300 m a-1 (Fedorovich et al., 1975). The Central Asian glaciers have been in decline since the end of the Little Ice Age. Analysis of aerial photography has shown that in the Ak-Shyirak massif 147 glaciers (83 per cent) retreated, 24 (13 per cent) were stable, and 7 (4 per cent) advanced between 1934 and 1977 (Chaohai and Tianding, 1992). 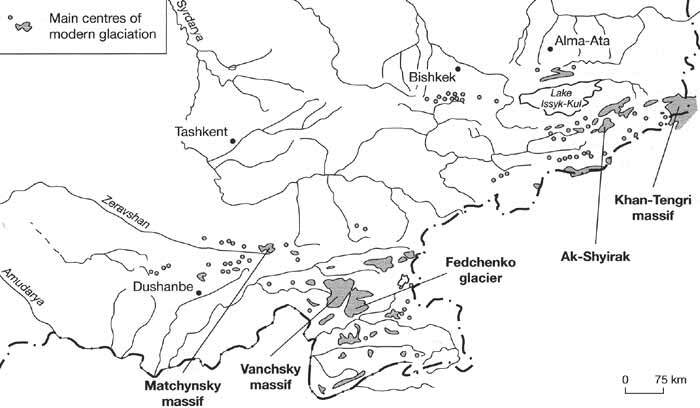 In the Zailiisky Alatau, glaciated area decreased by 63.3 km2 between the mid-1950s and 1980. Since the 1970s, the retreat rate declined in response to higher precipitation observed between 1961 and 1972. In contrast to the Alps and the Caucasus, precipitation and summer temperature (which controls melting) in the Central Asian mountains did not vary synchronously and the decline was marginal especially in the eastern regions of the Tien-Shan where a summer maximum in precipitation occurs. Despite the recent tendency towards reduced retreat rates, long-term observations indicate that glaciers, which are in equilibrium with their climatic environment, such as for example, the Shumsky glacier in the Dzhungarsky Alatau, display trends towards slower ice flow, more negative net balance, and faster rate of ice thinning (Cherkasov et al., 1996). This points to the evolution of a climatic environment that is less conducive to the maintenance of glaciers. Given the importance of alpine glaciers as sources of water for the plains, this trend is alarming. Numerous attempts at forecasting glacial change have been made. Thus according to Dikikh and Usubaliev (1996), in the future glaciers in the Tien-Shan may disappear at an altitude of 4100-4300 m and below, while glaciation in the Chu basin may decrease by 20 per cent. By 2020, glaciation may decline by 75-80 per cent on the southern slope of the Kungey-Alatau and on the northern slope glacial discharge may increase by 40-50 per cent due to the changing ratio between ablation and accumulation (Dikikh and Usubaliev, 1996). In the eastern Pamir and central Tien-Shan, discontinuous permafrost and cryogenic relief forms occur widely at an altitude of about 3800 m. The extreme aridity of climate (particularly in the eastern Pamir) and low moisture content of soil control a high position of both the upper and lower boundaries of permafrost distribution, shifting it 500-800 m upwards in comparison with more humid environments (Gorbunov, 1990). Thus, in the eastern Pamir, the altitudinal permafrost boundary is positioned about 500 m higher than at the same latitude in the Qilan-Shan mountains which receive ten times more precipitation. Due to soil moisture deficiency, large (several metres in dimension) cryogenic forms of relief are rare and confined to the more humid localities. Cryogenic microforms — solifluction micro-terraces, miniature sorted polygons, and stripes, etc. — with dimensions of few centimetres are ubiquitous, giving slopes a characteristic patterned appearance.